The Ministat 100 is an on/off thermostat that can be used for controlling the temperature of non-light emitting heat sources up to and including 100w. 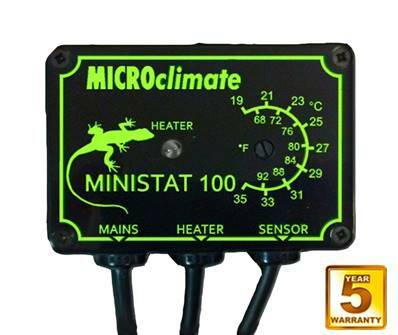 The Ministat 300 is the perfect companion to any vivarium providing an excellent level of thermal control . The temperature adjuster on the Ministat is recessed which prevents the temperature being accidentally knocked and changed which would be easily done with a protruding control knob. The Ministat 300 is an affordable solution to give peace of mind when running all types of heat sources within your vivarium.